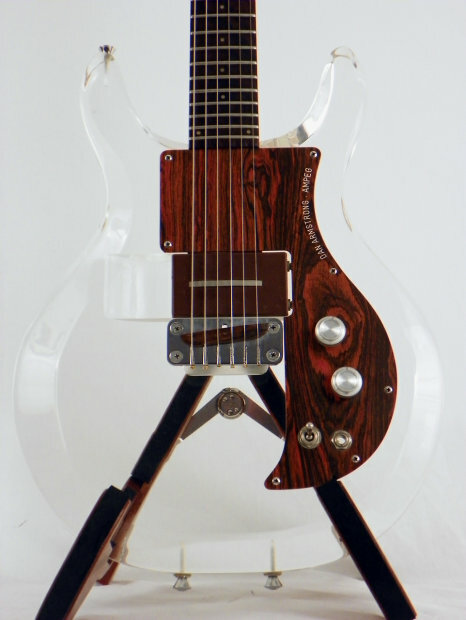 Here's another '69 era Dan Armstrong being offered on the Reverb auction site by dealer Empire Guitars. Asking price is $4,125. "From Keith Richards to Greg Ginn to Dave Grohl the Dan Armstrong has consistently been one of the most iconic and unique guitars around! 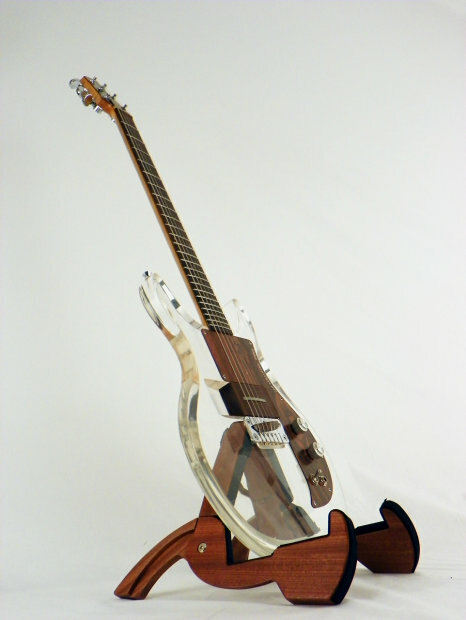 The two most unique features of this incredible guitar are its see-through Plexiglass body and removable pickup. It was produced from ’69 to ’71 (There was also a short-run of them produced in the late 1990s and a second re-issue released in the 2006 but nothing beats the real deal Armstrong)." "This Armstrong has a serial number of A979D and dates back to about 1969. The bolt-on maple neck has 24 frets with a rosewood fingerboard. 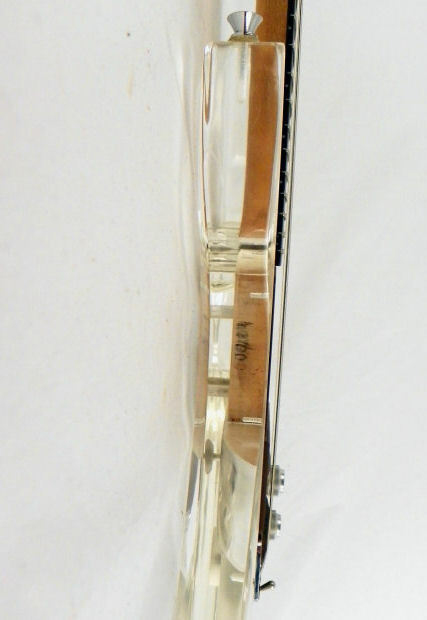 It is 24.75” scale with Grover tuners on the headstock. 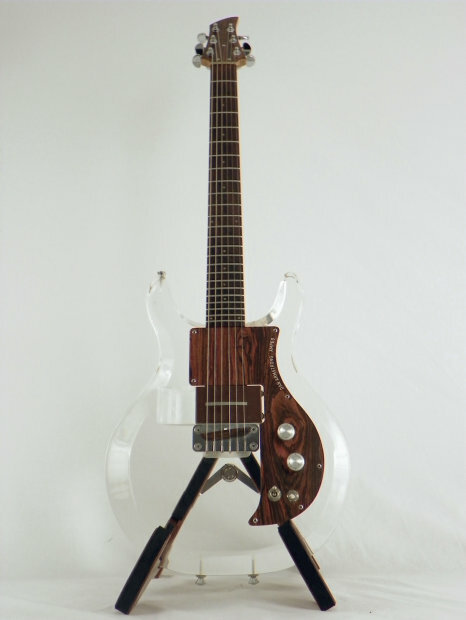 The Formica “Fake wood panel” pickguard and headstock laminate add to the kitschy “Me decade” cool of this rare bird. The output is built into the guard, as is the 3-way tone switch, master volume, and tone with “Ampeg Dan Armstrong” impressed into the treble hand side of the guard. 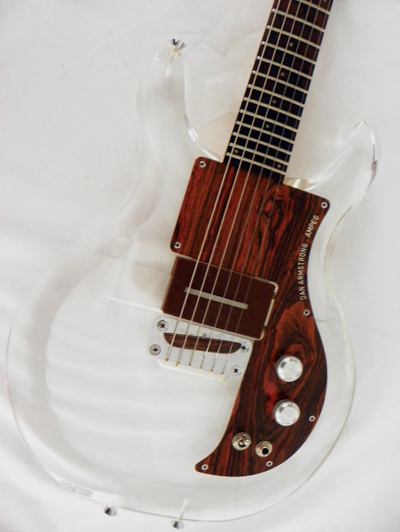 This particular example sports the original “RT Rock Treble” pickup, among the six options originally designed by Bill Lawrence (only the RT pickup is included with this particular guitar)." 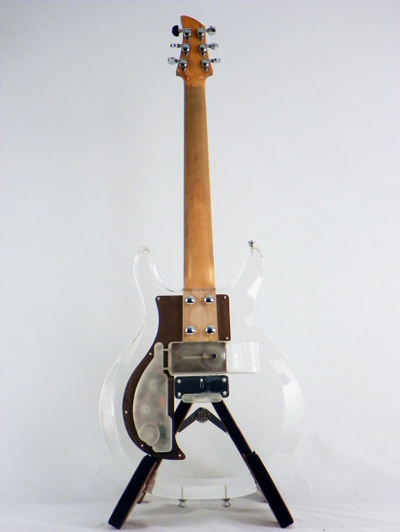 "The Lucite guitar has an undeniable appeal to both classic rockers and died-in-wool punks, popping up in the hands of the guitarists of bands as varied as Unwound, Descendents, and the Melvins to Aerosmith, the Georgia Satellites, and Steve Miller. It has a reassuring hefty sturdiness to it, weighing in at about 9 lbs 9 ounces. 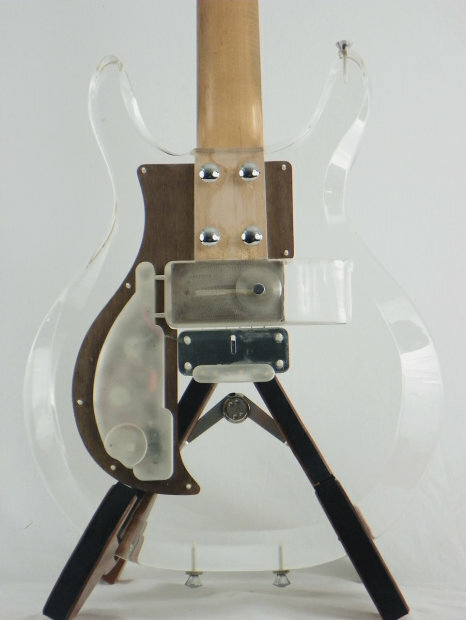 The body is in great shape considering the age of the guitar, with only light playwear and minor scratches. It is one of the better-looking Dannys that we have come across over the years. The neck is so nicely broken in that it is simply a dream to play. If you have always dreamed of taking a rockstar stance and pounding out some evil power chords while the L.A.P.D. swarm around the crowd, cracking skulls, then find your inner Greg Ginn and start thrashing away! Or maybe you’re more Keith Richards, cigarette dangling off your lip as you strum some open chord blues. 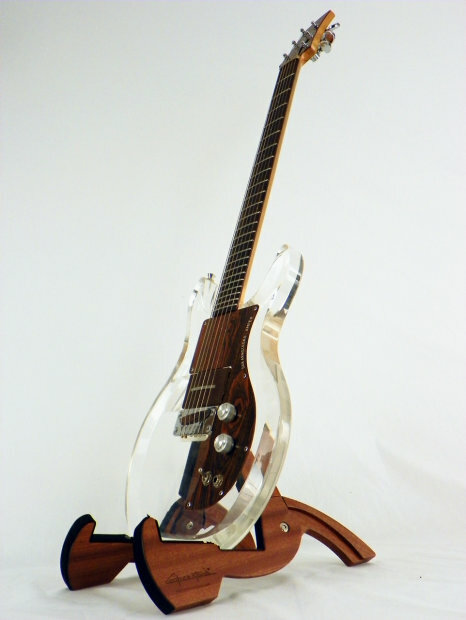 Either way the Dan Armstrong Lucite is the perfect guitar for you to start acting out your rock n’ roll dreams! Includes original hard shell case."